class="page-template-default page page-id-200453 group-blog masthead-fixed full-width singular wpb-js-composer js-comp-ver-5.7 vc_responsive"
This marked the last day of activities for the delegation before returning home. The delegation spent the morning at the Consulate General’s in Hong Kong. They first got a briefing on what the Consulate does. Hong Kong is a special administration because it is transitioning from a British colony to China. It is known for being the most open ‘country’ to trade with and is the eighth largest in terms of global trade. Hong Kong has the worlds fifth largest sea, container port. They also have the world’s busiest cargo airport and eight largest for passengers. The United States serves as their number one importer of agriculture products and food and beverage. China is number two in both categories. 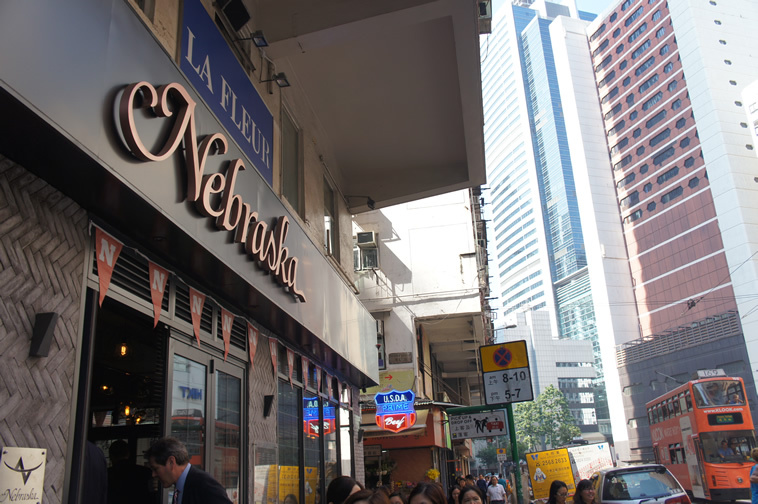 Nebraska restaurant in Hong Kong. Hong Kong is a five hour plane ride from half of the world’s population. It serves as a gateway into China and other areas. It is a conduit for over 60 percent of all mainland China’s outbound investment. In 2015, $8,465 million were re-exported. 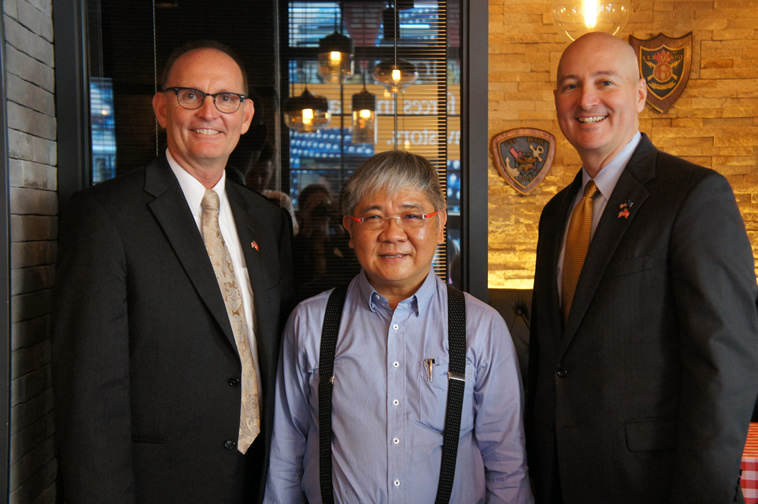 NDA Director Greg Ibach, Nebraska restaurant owner and Governor Pete Ricketts. After the briefing, the delegates went to eat lunch at a restaurant called ‘Nebraska’. They have been serving Nebraska beef since the 1970’s. The name more recently has been changed to ‘Nebraska.’ There the delegation ate Nebraska beef and the Governor singed two letters of intent to purchase more Nebraska beef. 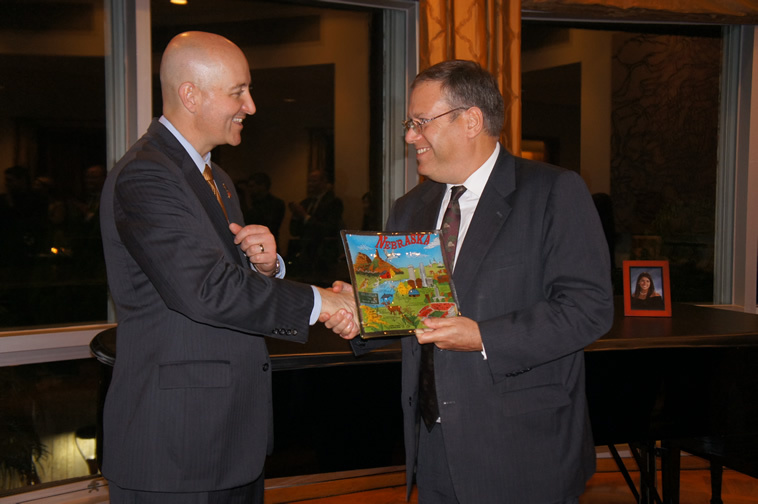 Governor Pete Ricketts and US Consulate General. To conclude the trip, the delegation went to the Consulate General’s residence to eat Nebraska beef and pork and to talk with importers of our products. Nebraska beef continued to be the theme as the delegation continued their trade mission. They spent the day in Macau. The first stop was to the Institute for Tourism (IFT). There they were served lunch by students. Then they toured the facilities. USMEF also works with the IFT and several posters can be seen throughout their facilities. NDA Director Greg Ibach, spoke to a class about why ‘Nebraska beef, is the best in the world.’ This included the ‘golden’ triangle and why the end product is superior. 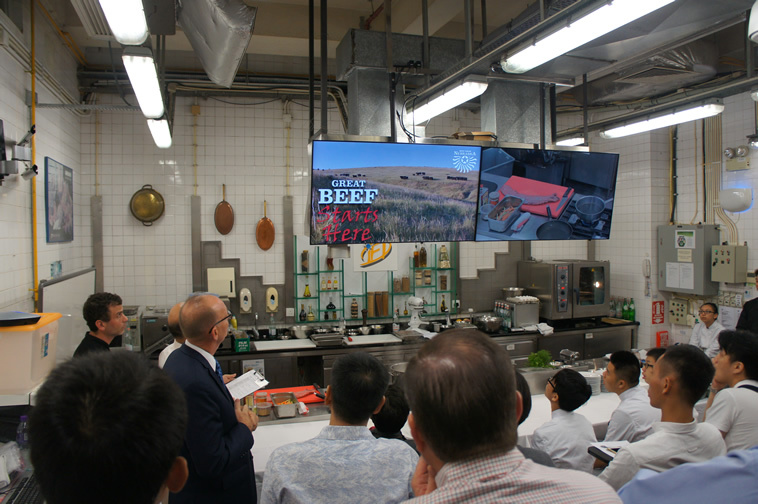 The class was then able to see a cooking demonstration where a guest chef was to cook Nebraska beef. The delegation was then able to tour Studio City hotel and casino. They have their own kitchen for staff and own bakery. Combined between staff meals and guests, they can serve around 30,000 meals a day. Deb Gangwish, board member with Nebraska Corn Board and farmer from Shelton, Neb., says the trip has been important. “It’s been instrumental to be able to actually witness firsthand this culture and the increase in protein consumption and the vast number of people; to see the incredible demand that is blossoming here – for our product corn because of the livestock industry,” said Gangwish. The casino was also the venue of the fifth annual Nebraska BBQ. Around 350 people were in attendance. It was jointly hosted by USMEF and Nebraska beef council. 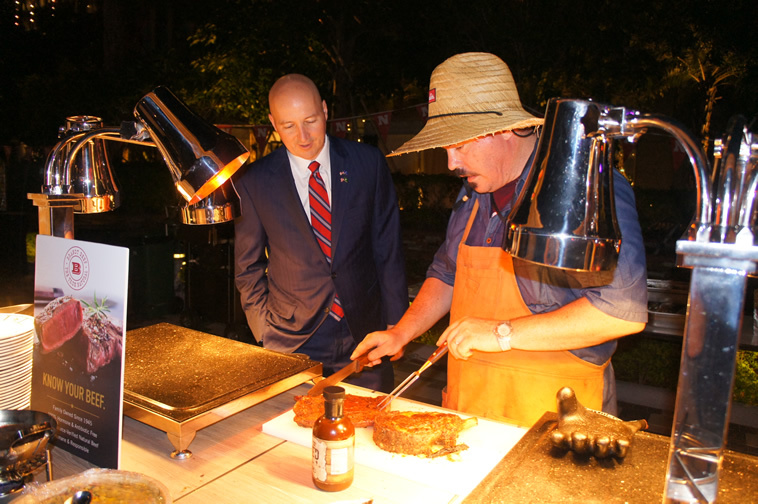 The governor signed six letters of intent to purchase Nebraska beef during the event. One statehood was also given. Troy Stowatter, president elect of Nebraska Cattlemen discusses what it was like as a producer to be at that dinner. “As a feedlot producer, in Nebraska, all the companies that I do business with were represented there. The second this is that, they all had samples which were passed out and our product was well represented,”said Stowatter. The group traveling with the NDA left in the morning for Hong Kong to tour Disney Land. 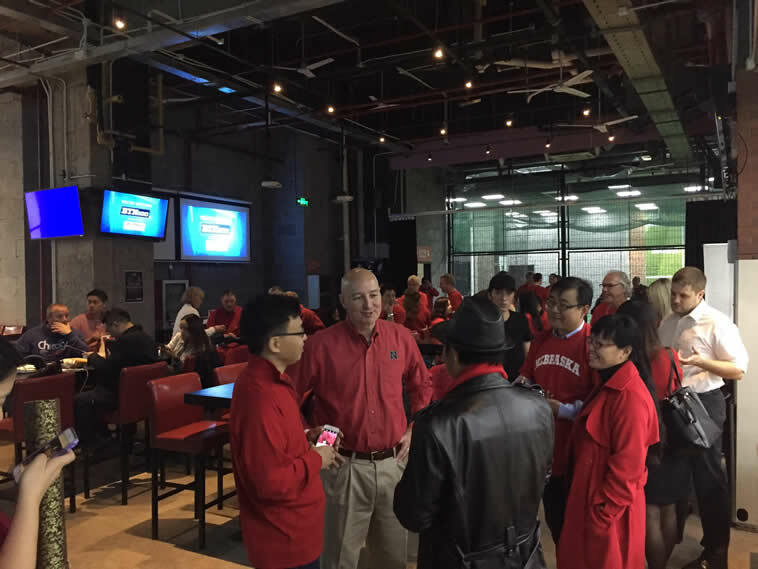 The delegates with the Governor and DED hosted a tailgate in Shanghai for alumni of the University of Nebraska. Nebraska Pork Producers and Corn Board helped to sponsor the event. 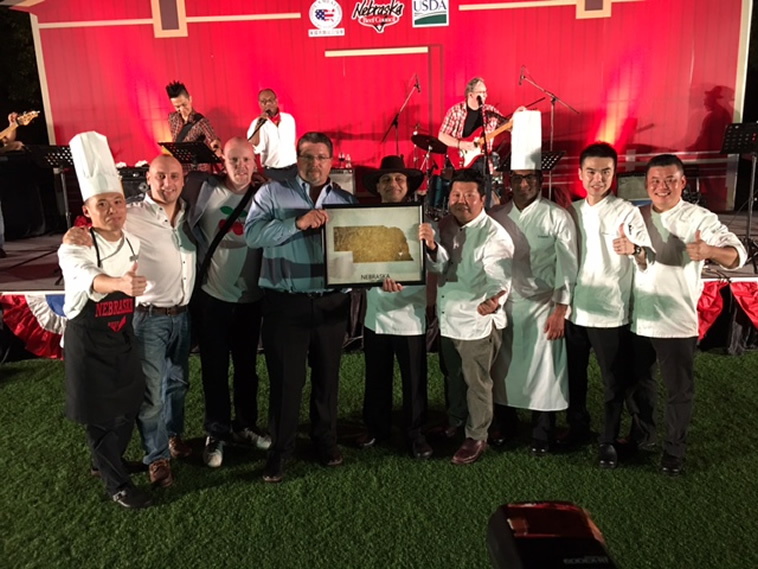 Chef Rudy Muller, Culinary Director of Hong Kong Disney Land Resorts created a meal for the delegation and was joined by the purchasing director for the entire resort. 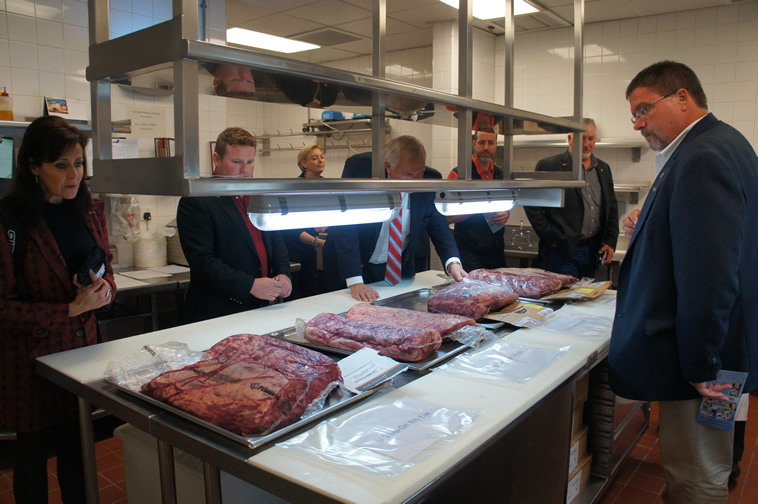 Chef Muller then toured the delegation around the back of the house, showed them Nebraska beef and to the kitchens. The resort is made up of the entire park and two resorts (with a third being built). The park can feed up to 30,000 people a day – sometimes 45,000 if they are really busy. Chef Muller says out of all the beef sold, 70 percent comes from Nebraska. They purchase multiple different cuts, depending on their need. It all started about eight years ago when the NDA started to work with the Chef to promote Nebraska beef. Chef Muller even traveled to Nebraska touring the whole beef system. He says it gave him lots of confidence to sell the product to their customers. “So, when I sell Nebraska beef, I can be very confident about it. Because I know it is done in the proper way. You are very quality orientated. The people are passionate about what you do in Nebraska,” said Chef Muller. The delegation was able to see Nebraska popcorn and where a majority of soybeans are processed. Twenty-five percent of Nebraska’s beans are exported to China. China’s soybean processing is around 7.63 million tons a year. Year-on-year growth is at 11 percent, most of which is imported. 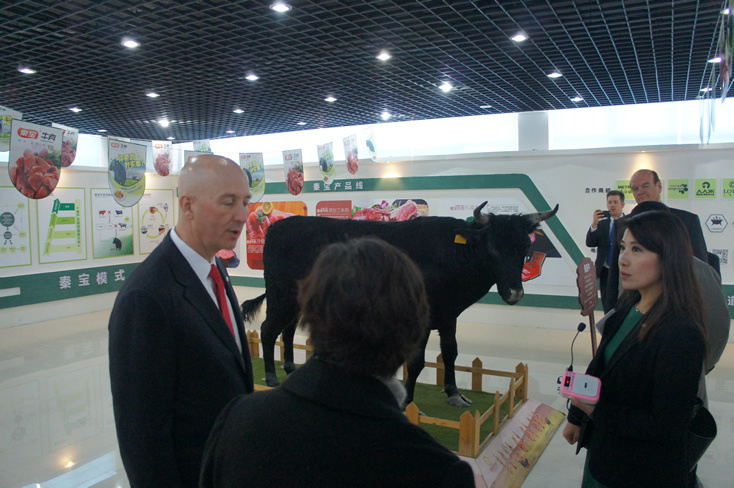 Delegates were able to see how they are processed in China by touring COFCO EOGI. COFCO is the largest crusher in China with 20 facilities found throughout the country. They are a state-owned company, meaning the majority of the shares of the company are owned by the Government. They function just like a no state-owned company. 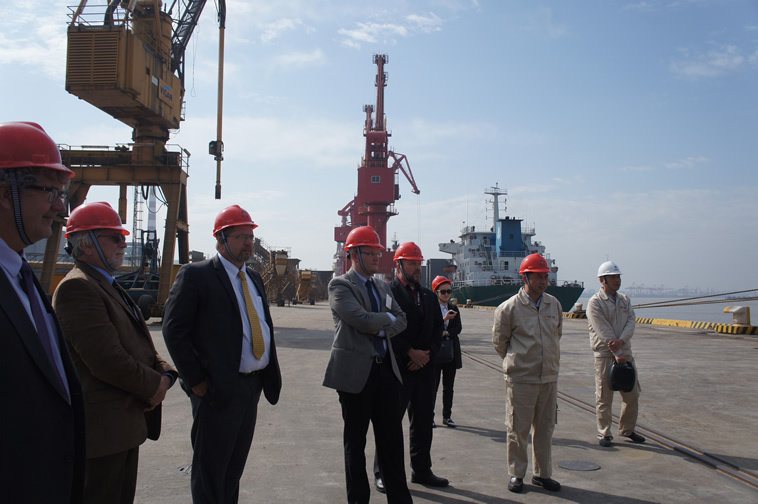 The processor the delegation tour was situated along the Yangtze River – the third largest in the world. They stated building facilities in 1993. At this specific facility, they import soybeans and crush them. In 2015, with all the facilities, they had a 13.32 million tons crushing capacity – at 120,000 tons per day. Along the Yangtze River, they crush 12,000 tons per day. This equates to enough soybean meal to feed 35 million pigs in one year. COFCO not only crushes their own beans but also bottles their own oil. They make five different types of oil. They also import other oils, like sunflowers, and bottle that oil. COFCO also makes and sells their own flower. Total production along the Yangtze River is 750 metric tons per day equating to 800 metric tons of feed. The second half of the day was spent only on Nebraska popcorn. Preferred Popcorn, out of Chapman, Neb., helped to start a ‘ready to eat’ plant. A ready to eat plant is where the popcorn in is popped and then bagged. The facility has all American made equipment and they import Nebraska white popcorn from Preferred Popcorn. Preferred Popcorn and their purchaser hosted a celebration dinner in honor of another purchase agreement being signed. The theme of the night was integrity. 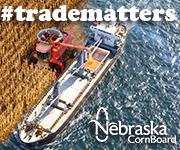 “If there was any value that Nebraska farmers have, that value is integrity. They rise early in the morning, they work late at night and at the end of the day, Nebraska farmers do what they say they are going to do. And whether that is in Nebraska or China, that is a universal value that people want to respect and desire. 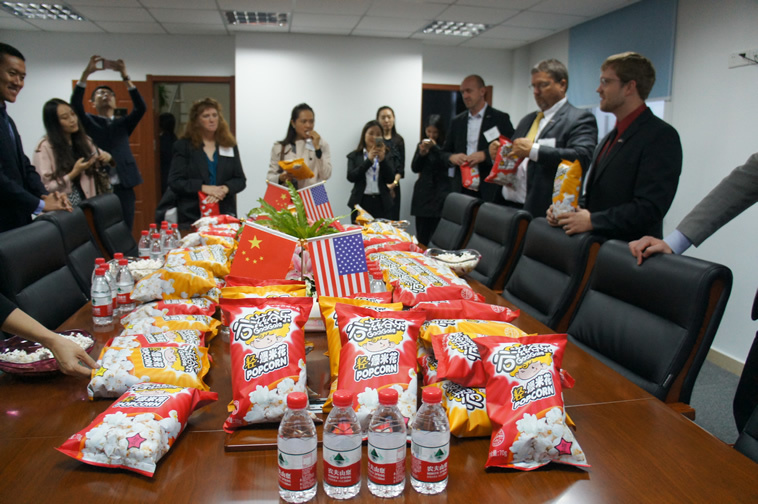 And that is a huge reason for the partnership that we have with our partner here in China,” said Sam Krug, general manager of Preferred Popcorn. This is the first day in Shanghai. The delegates were briefed by the Consulate on the culture, agriculture, business and trade. Tyler Babcock, Deputy Director for Agriculture Trade with the Foreign Agriculture Service (FSA) with USDA, said in 2015 seventeen percent of all U.S. agriculture exports were to China at $25.9 billion. 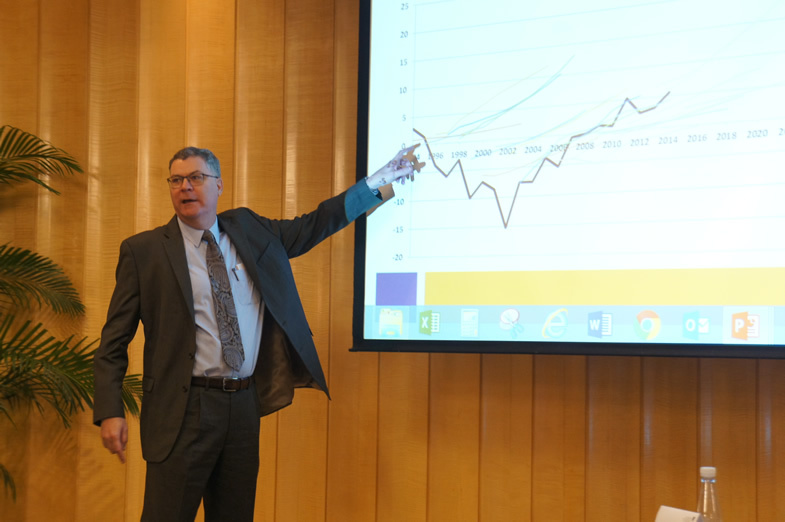 USGC’s Director for China, Brian Lohmar, discusses the corn, ethanol, sorghum and wheat markets. The U.S. Grains Council, U.S. Meat Export Federation, Food Export Midwest and U.S. Soybean Export Council also discussed their efforts in China and what the market place currently looks like. 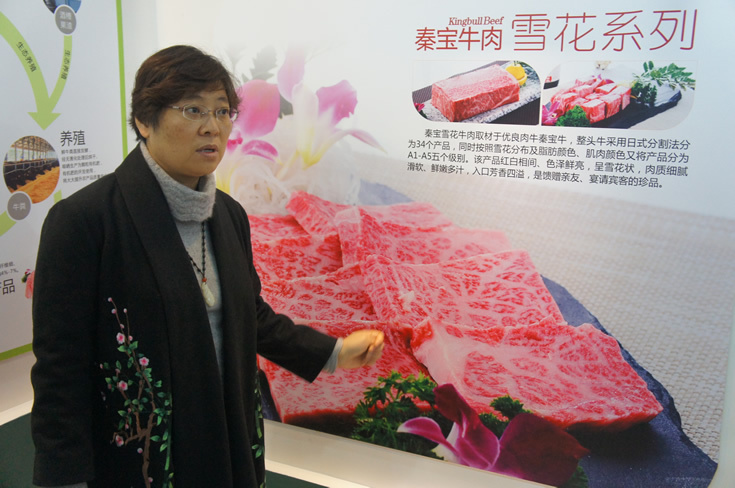 One of the major topics of conversation was U.S. beef imports into China. The country recently announced it was dropping the ban on U.S. beef because of BSE from 2003. The details are still being worked out between two countries for how it will end up looking. But, consumers are excited to be bringing U.S. beef back into the country. 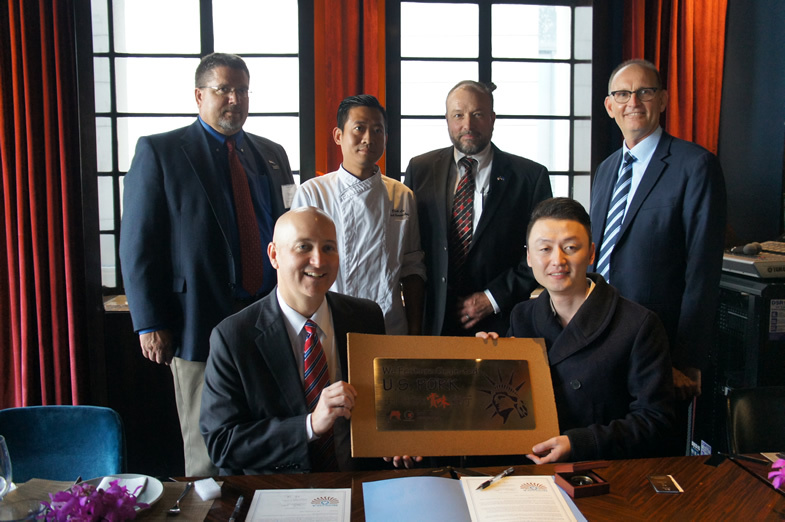 This discussion carried over into a letter of intent singing with the restaurant Yue 6. They are currently using Nebraska pork and singed a letter to purchase more. They also singed a letter to purchase Nebraska beef, in anticipation of the markets being fully open. 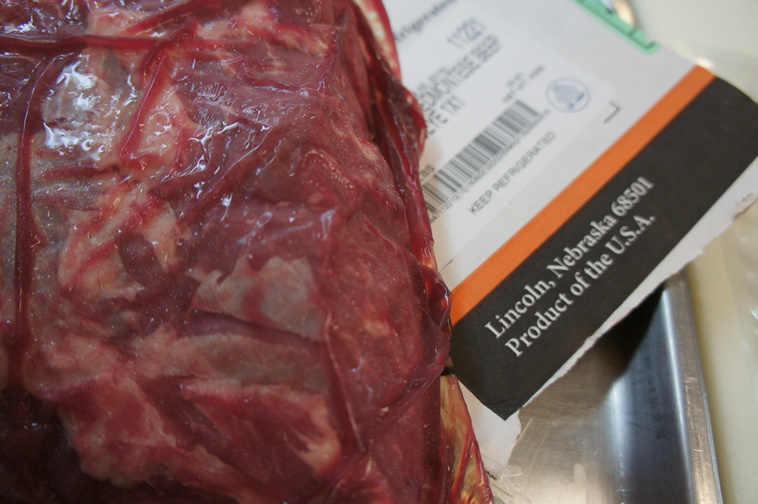 The chief has been a longtime user of Nebraska beef, as he was using it before the ban in 2003. Meetings and expanding relationships were the focus of the day’s activities. 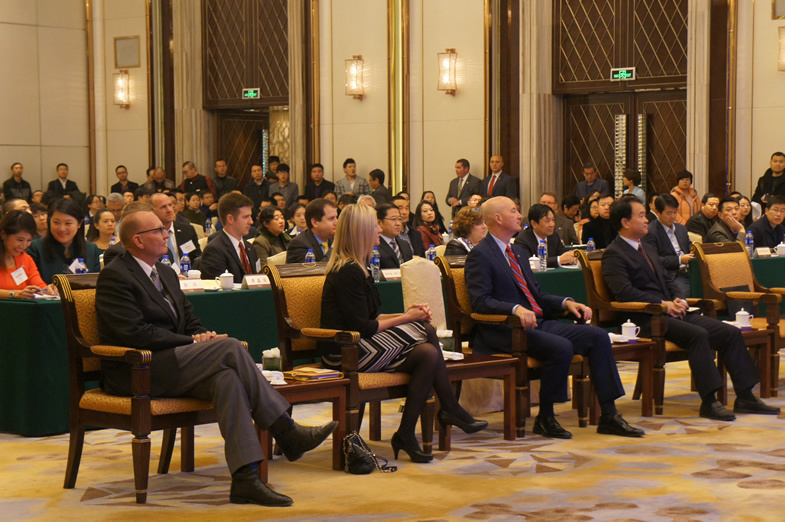 A business to business meeting took place between Chinese companies and Nebraska companies, county economic development staff and government staff. This is also the final day in Xi’an. The delegation was able to learn more about the province and Chinese companies learned about Nebraska. They then broke out to make connections to hopefully expand exports or start businesses in Nebraska. 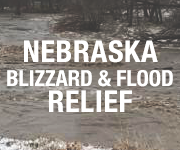 It’s activities like this that have opened up opportunities to Nebraska companies. Preferred Popcorn exports about half of their product. 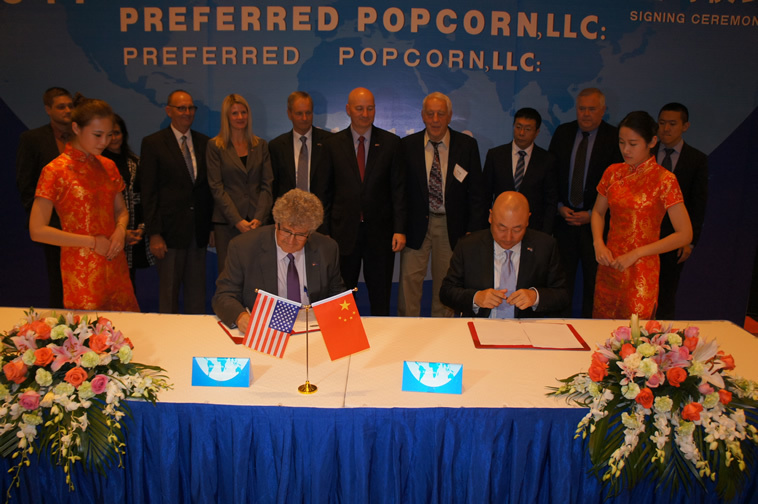 “We actually started in a previous Governor’s trade mission and we continue to participate because we’ve had a great experience in selling Nebraska popcorn to China,” said Norm Krug, CEO and Founder of Preferred Popcorn. The relationships will continue to build thanks to the Sister-State Agreement which has been in the process for four years. “It’s been kinda a long process to get to, to where we are in the singing but, now we will really see it take off,” said Walker Zulkoski, Executive Director of NGage. 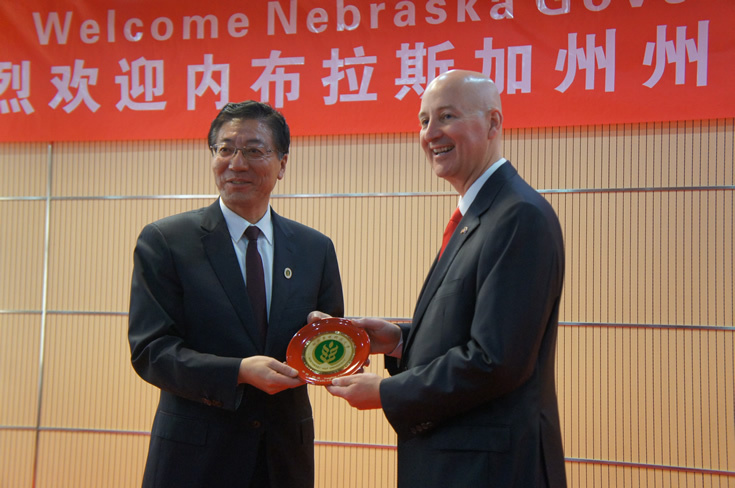 Governor Pete Ricketts, Nebraska Department of Agriculture and Department of Economic Development, started the trade mission in Xi’an, China. Forty-one delegates make up the team at this stage. They include businesses, government staff, agriculture producers and departments of economic development. Ceremony discussing the relationship between China and Nebraska. 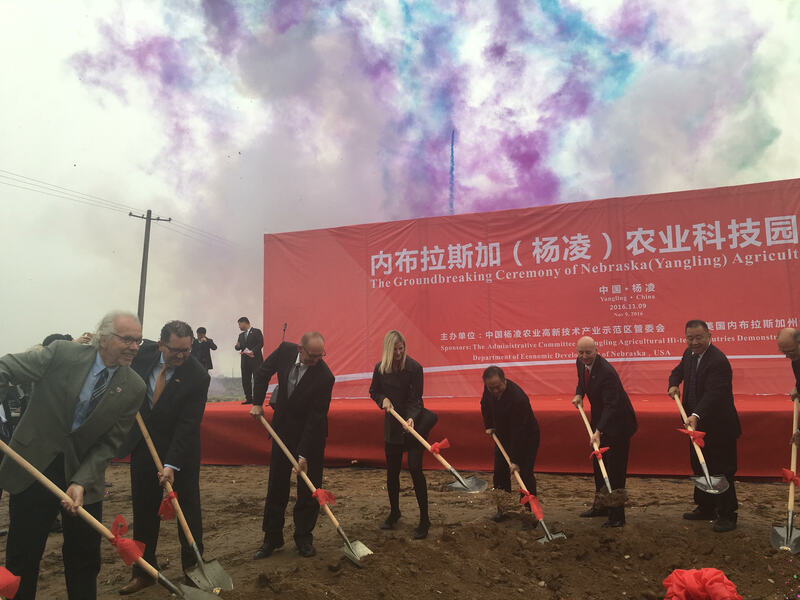 The trade team kicked off the day at the ground breaking of the Chin-US Yangling Agriculture Sci-Tec Park. 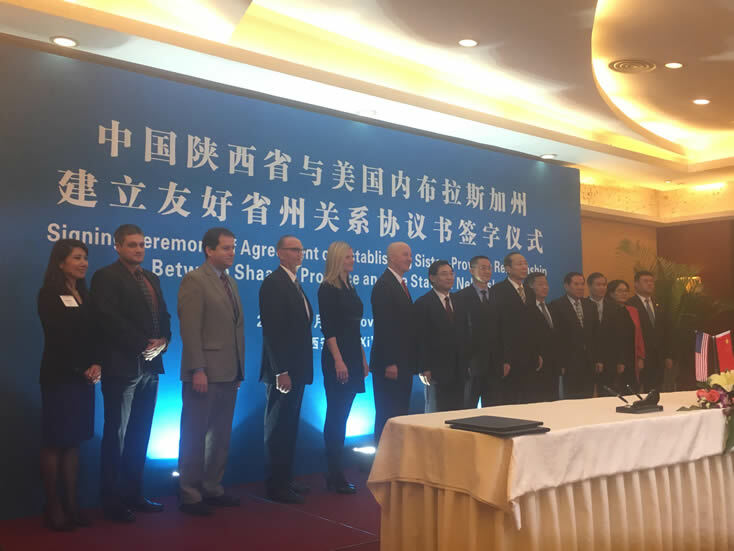 It will be a partnership between Nebraska and the Provence with the assistance from the University of Nebraska and North West Agriculture Forestry University (NWAFU) in China. Research and test plots will be completed here. The actual ground breaking for the event. 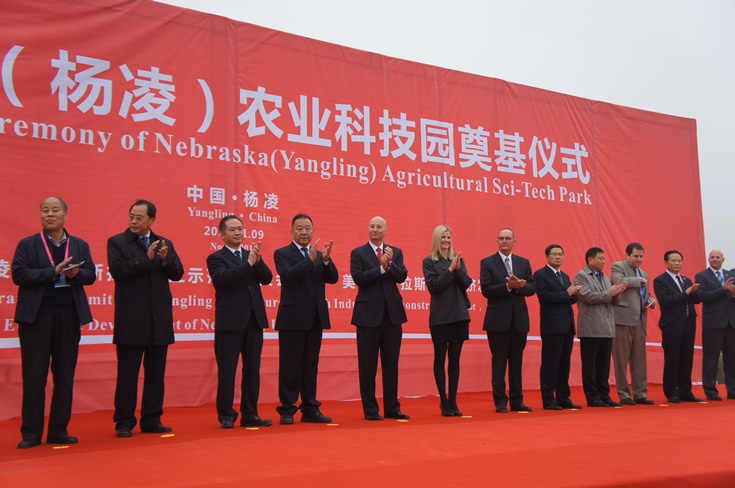 The team then walked through the Nebraska pavilion at the Yangling fair. Business included were Lindsay, Reinke, Valley, Jarvis, Kelly Ryan and Behlen. Lunch was also had at the fair. Learning about Kingbull Cattle Company’s breeding. Showing the marbling of the desired beef. Before lunch, the delegation meet with representatives and toured Kingbull Catte Company. They are the fifth largest producer in the country. Not only do they process the meat, they raise the cattle too. 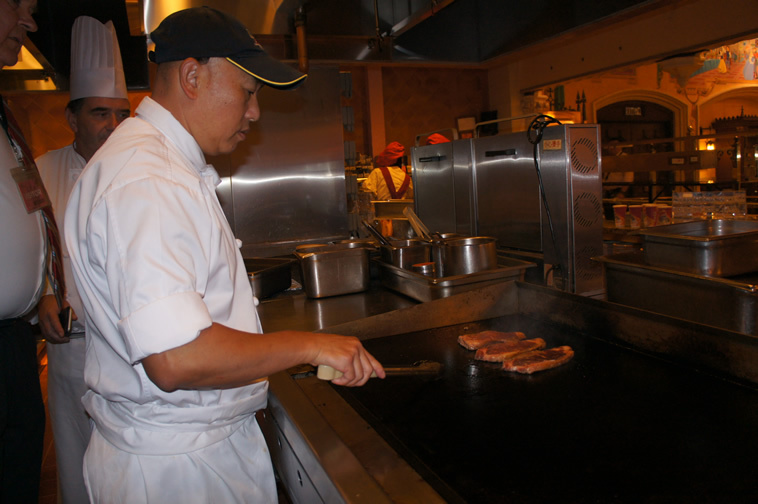 They import Wagyu cattle from Japan and black Angus from Australia. They breed these cattle to their own local yellow cattle. At the facilities toured by the delegation, they had around 10,000 head. Due to lack of supply, they only harvest 100-200 head per day. Exchanging gifts between the Universities. The Governor and Yoder were both able to speak to students at NWAFU. They discussed the program between the two Universities. Governor Ricketts even took questions from students. To end the day, sister-state agreements were signed. Signing of the Sister-State agreement.